Choose your rainforest adventure tour in Tambopata. It is a private ecological reserve and research center on 10,000 hectares (24,710 acres) with over 27 years promoting the sustainable use of the Amazon rainforest. Its spacious and well equipped facilities ensure guests a pleasant stay, comfortable and safe. Excursions in this program are "A la carte", but we recommend the following itinerary. Welcome and transfer from the Puerto Maldonado airport to the city pier. Preparation for the trip on the Madre de Dios river. Visit to the Puerto Maldonado city market, where you can buy Brazil nuts, aguajes, pacays, coconas, cashew nuts, and star apples, as well as other typical tropical forest fruits and nuts and local handicrafts made with seeds from the Amazon region. This activity can be carried out on arrival or departure from Puerto Maldonado, depending on flight schedules. Embark on 45-minute trip downriver in outboard motor boat. Along the river one can appreciate caimans (alligators), birds and flowers, etc., native to the region. 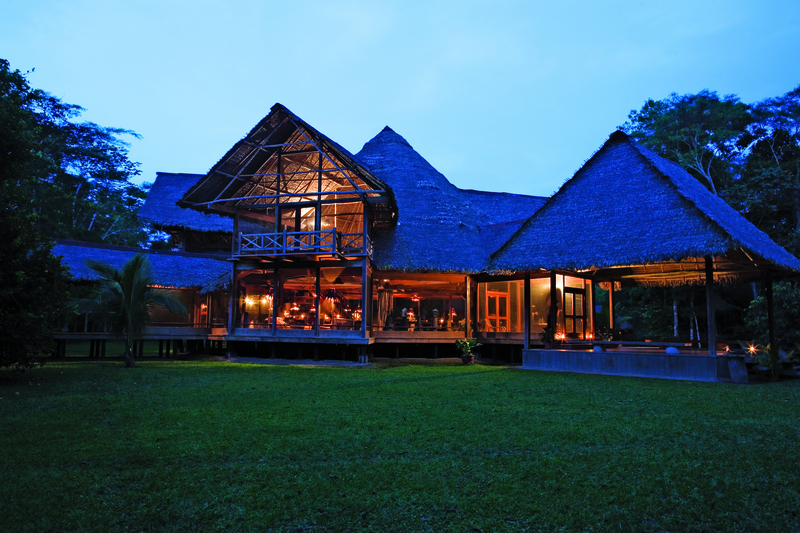 Arrival at the Inkaterra Reserva Amazonica, situated on the left bank of the Madre de Dios river. Welcome, explanation of the architecture and orientation of the lodge, built entirely by local indigenous people using axes and machetes and according to Iñapari, Mashco, Amaracair, Dipo and Ese-Eja customs. Enjoy the excursion to Lake Sandoval : A 30-minute boat ride takes you to the Tambopata National Reserve, where wildlife surrounds you as you enjoy the one and a half hour walk along three kilometers of trails to reach Lake Sandoval. Glide in a wooden canoe, across a beautiful, mirror-like oxbow lake that is home to the endangered giant river otter, as well as red howler monkeys, macaws, prehistoric hoatzins, also called “shanshos”, anacondas, point-tailed palm creepers and side-neck turtles. You will spend two hours on the lake, looking at all is has to offer. In the afternoon, Inkaterra Canopy Walkway & Anaconda Walk: Take a 15-minute walk along the trail towards the Inkaterra Canopy Interpretation Center. A short briefing will be given about the project history, structure and the highlights in this unforgettable adventure at the Canopy Walkway. You will ascend the first tower and walk through the treetops of the giant Amazon Basin, across hanging bridges. Views unimaginable from below and possible only from the air, are revealed on this network of towers, bridges and platforms. Be on the lookout for different birds of the jungle, such as toucans, woodpeckers, trogons, among many others, or try to identify them through their songs, from the observation decks. Learn about the interrelationship of the flora and fauna at the various levels of the forest and its integration into the jungle ecosystem. Native experience: Visit an indigenous Southeastern Amazon family, part of Inkaterra culture conservation & support project for the native community, help preserve their age-old customs while adapting to modern life. A twenty minute boat ride will take you to this local household, where you will see prototypes of their ancestral dwellings. You will be introduced to the family members who, along with the Inkaterra interpreter’s simultaneous translation, will show you their customs, traditional daily living, basic hunting skills, farming and food preparation. You will also see a cemetery replica to see their traditions about their deceased; however the fun part begins when you play their native games, such as their spinning top, among other ingenious diversions. Assistance with your luggage, prior to boarding your flight to Cuzco or Lima. Fly to Lima or Cuzco. Children under 12 pay half the rate when and only when they share the cabin with an adult - for safety reasons, bringing children under 5 years old is not recommended. Rates and programs are subject to change without prior warning. Includes 10% of services taxes. INRENA fee to enter Tambopata Reserve.